Andy continued his Thailand fishing holiday with a visit to the highly prolific Barramundi ponds near Bangkok. On arrival at the Barramundi ponds the angler wasted no time in attaching a saltwater fly and began making exploratory casts into one of the larger fishing ponds. On only his second cast the anglers fly was savagely struck as a highly acrobatic Barramundi threw itself clear from the water attached to his #4 weight outfit. Andy played the Barramundi with caution on the light fly fishing outfit as it threw itself out of the water on several further occasions. Finally the energetic Barramundi began to tire and was gently guided towards the waiting landing net. 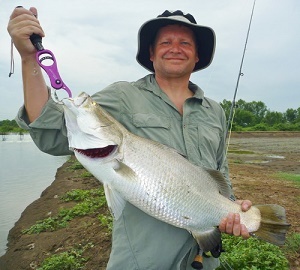 The Barramundi on this occasion weighed only 3kg’s and was quickly photographed before being released. Further casts into the various Barramundi fishing ponds resulted in a succession of hard fighting Barramundi ranging between 2-6kg’s. Andy regularly changed fly pattern to keep in touch with the Barramundi and adopted a roving approach casting into each pond. Altering his speed of retrieve also helped Andy to keep in touch with the Barramundi which continually slammed into his carefully presented saltwater flies. At the end of the days Thailand Barramundi fly fishing trip at the Barramundi ponds near Bangkok Andy had amassed a twenty plus fish capture of hard fighting Barramundi with weights between 2-6kg’s.